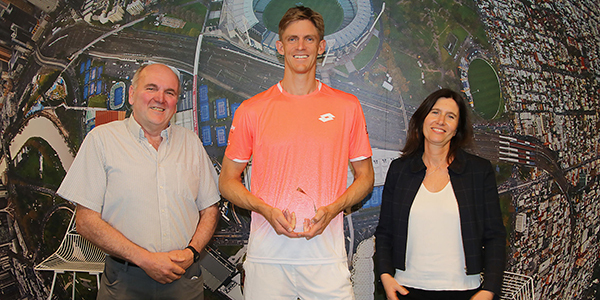 Melbourne, 11 January 2019 – Kevin Anderson and Simona Halep have been honoured in the International Tennis Writers’ Association’s annual “Ambassador of the Year” awards. Both are first-time winners of the awards. The awards are given each year to one man and one woman after a vote by the 120-plus members of ITWA, which represents the world’s leading tennis journalists. The awards recognise a combination of achievements on the court, conduct that shows tennis in the best possible light and co-operation with the media. Anderson enjoyed the best year of his career in 2018. He reached his second Grand Slam final at Wimbledon, won his first ATP 500 title in Vienna and achieved a career-high world ranking at No 5. Halep won her first Grand Slam title at the French Open in 2018 and retained her position at the top of the world rankings at the end of the year despite having to finish her season early because of a back injury. 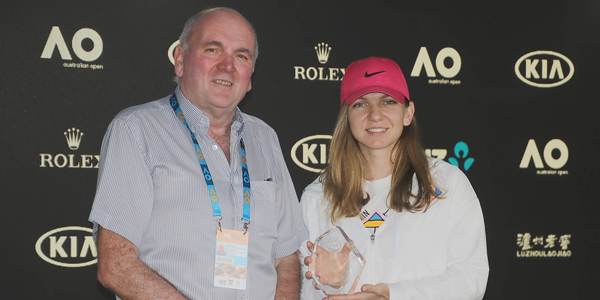 Simona Halep receives her award from ITWA’s Co-president Paul Newman. This content is restricted to ITWA members. If you are an existing user, please log in. For membership information, click here.